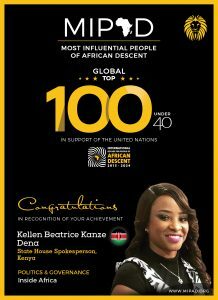 Kellen Kanze Dena is the State House Spokesperson and Head of the President’s Strategic Communication Unit (PSCU) to President Uhuru Kenyatta. Kanze becomes the first female State House Spokesperson and Head of PSCU in the history of Kenya. Her elevation is in line with President Kenyatta’s recent public appointments in which the Head of State has appointed high achieving women to key positions in his government.